Mix 1 gl of milk, 1 gl of flour, 3 yolks, baking powder, 2 tbsp of sugar. Separately mix 3 whites into airy white foam. Mix resulting part of dough and add 2 tbsp of oil. Serve with jam, syrup or honey to tea. Very simple to prepare pancakes. Dough turns out very airy. Bake for 15 sec for each side till golden crust. Very desirable that the pancakes came of round shape. I have not yet adapted so by trial and errors find the optimal diameter of about 10 cm and look carefully and are easily turned. Very quick to prepare and hearty for breakfast. 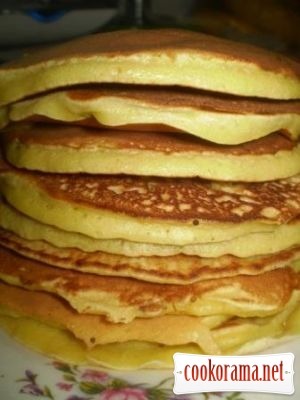 Top of recipe "American Pancakes"
Попросил маму приготовить. Мне понравилось. Вот решил рецепт добавить.